Here's my attempt to recap only the productive parts of a previous topic that got unfortunately polluted with dramatic garbage. But the appearance of Thomas in Kung Fu resembles a redrawn version of the Tennis and Soccer characters more than that of the arcade game Kung Fu Master from which it was ported, itself a video game adaptation of the film Wheels on Meals starring Jackie Chan. Outlines became more common later. Compare Super Mario Bros. to Super Mario Bros. 3 or Donkey Kong for NES to its 1994 expanded remake for Game Boy. And to make it clear, I'm not referring to box art. Why do Soccer, Tennis, Baseball, and Kung Fu share an art style that other NES launch games don't? Did they share artists? Why weren't outlines used early on? Are there other aspects not yet mentioned that distinguish the art style in these games in particular from that in other games? Why was Thomas in Kung Fu changed so much? Have any of the people who worked on these games mentioned the rationale behind this art style? Whom would it be most productive to contact, and how could we phrase such an inquiry most effectively? Perhaps Nintendo wanted to distance the NES launch lineup from what was seen on pre-Crash consoles by not using the 1-pixel-wide limbs common in Atari 2600 and Intellivision games. So it used the stubby style similar to that of Mario in Donkey Kong for Villager in Balloon Fight and Popo in Ice Climber, whose heights are close to Mario's. But because the characters in Tennis and Soccer are taller than all three and Mario and wearing less bulky clothes than Popo, there's more room for realistically proportioned limbs. Early games may not have used outlines because artists were still adapting to three colors, up from one or two on second-gen platforms, and non-black backgrounds. Perhaps Kung Fu looks like Tennis because IREM didn't want to have to pay for Chan's personality rights on the console version. Now might be the best time to ask Nintendo about this, just before the release of the forthcoming NES mini and before the artists pass away. The Japanese headquarters might have better answers than Nintendo of America, so we might need to get a Japanese speaker involved. A couple of koitsu's Twitter friends might know whom to ask. The most mundane (and therefore most likely) explanation is that various artists saw early examples of what "good graphics" looked like on the NES, as far as clarity and functionality were concerned, and just copied from those examples. That would probably explain the art styles in Kung-fu, Tennis, Soccer, etc. I'm personally a fan of the no-outlines art style of early NES games, but I also like painterly art. Edit: For information purposes, that arcade font seems to originate from Atari, and the 0 originally had a slash through it. A 6-frame version of the walk cycle can be found in the arcade version of Mario Bros, though I'm sure there's earlier examples of it floating around somewhere. itself a video game adaptation of the film Wheels on Meals starring Bruce Lee. It's Jacky Chan though. As far as I know Irem only secured the right to the film in Japan, thus it was called Spartan X after the name of the film in Japan, and renamed Kung Fu Master in overseas versions. The Famicom version was still called Spartan X though, so the theory that they redesigned the character to remove connection to the movie didn't seem legit. As to why they dropped the 'Master' in the title in the overseas carts, then it beats me. Maybe they thought Thomas in the home version was not 'Master' enough? Or, more likely, it was easier to hackconvert the original title Spartan X to the shorter title because of name table/space constraints. Early on, I don't think artists had access to the same tools we have today. 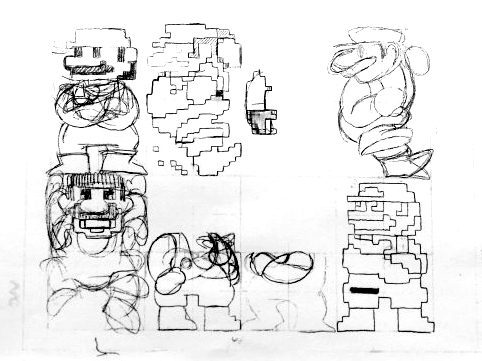 Sprites were often drawn on grid paper and then transposed into data pixel-by-pixel by a programmer. When drawing sprites like this, it's much easier to create a design using big, blocky chunks instead of filling in outlines. Look at Mario's face in that image I showed. Once you start adding in lots of pixel-level details things start getting pretty cluttered. Another theory: Early pixel artists prioritized the number of colors in a sprite more than graphical detail. It's easier to create a clear design when you have 3 colors to work with. Contrast Donkey Kong Mario and SMB3 Mario. The former has 3 colors to clearly separate his skin, overalls and shirt. The latter design has outlines, but had to sacrifice the blue overalls as a result. Also, it goes without saying, outlineless sprites work best when you can predict the color of the background. For most games, this was black. For sports games, it was usually green. This is fine and dandy for single-screen games like Kung Fu and Tennis, but you start to introduce problems once game worlds become bigger. An outlined character like Megaman can have virtually any palette and be put in front of any colored background. In contrast, SMB1 Mario could not be put against dark green, orange, red or white without bleeding into the background. But not a problem, since the scope of the game was more limited. Finally, I'm not an authority on this, but I imagine the quality of televisions got better near the end of the NES's lifespan. Bold, outline-less sprites don't look too great, but they hold up a lot better once you start throwing in NTSC artifacts. I guess by the time of Jackie Chan's Action Kung Fu, console game budgets had risen to where Hudson Soft could afford Mr. Chan. I guess that's what the programmer was going on about with "tracing holes" (ana wo nazoru) in the rant hidden in the PRG ROM of Pachi Com. That's only assuming that the sprite palettes are static and cannot change, and while that might be true for certain arcade machines, the NES lets you redefine the palette at runtime. Basically, if you know the background palette of one scene is going to conflict with the sprites, you have two options: 1) cleverly craft the scene so the player is always in front of non-conflicting background elements, 2) have that scene use a slightly tweaked sprite palette. For example, SMB3 gives the player a blue outline in dark/cave stages. This doesn't apply as much, but SML2 goes through the trouble of using an entirely different sprite sheet for dark stages. Either way, it's just pros and cons, and this particular art style might not even have that much reasoning behind it; What if it's only by chance that the artist happened to design the graphics this way, and everyone thought it looked good and copied the style? It's funny to think that we may be trying to extrapolate meaning behind design choices, when there wasn't actually any meaning to begin with. When you get down to it, most of the characters are going to come out the same or almost the same no matter who is drawing them, or whether they used another font as a reference or not. This is not like drawing a human figure where you can arbitrarily change body proportion, omit eyes or nose if you like, etc. In a font you must have spaces in certain places and you must have lines in certain places or the character will not be recognizable or legible; with only 8 lines there's only so many places you can put them. The rest of the characters look like more common choices to me, for a font under these constraints. When you add up all the distinctive characters, eventually a font becomes distinctive, but a lot of the individual ones end up being fairly common. Lowercase characters tend to have a lot more variation than the capitals as well, but so many of these fonts are capitals only. 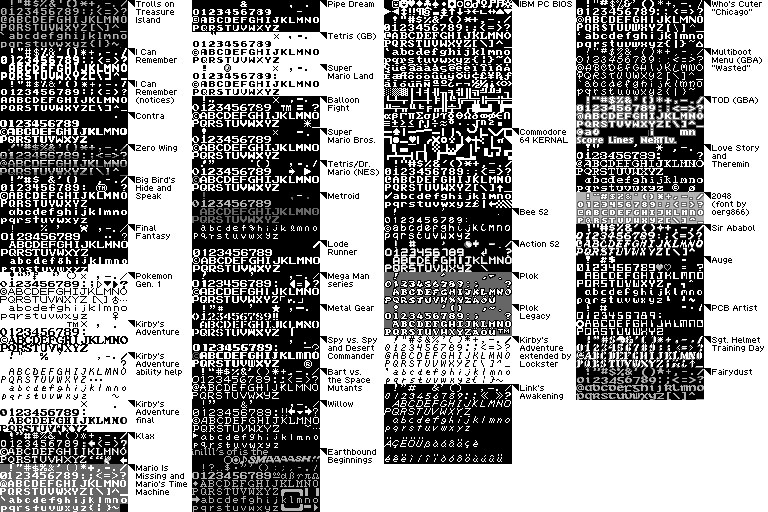 Unlike human heads, 8x8 1-bit text fonts have a lot of non-arbitrary constraints. If you start with particular goals there really are very few ways to draw a lot of characters. I thought you or someone else claimed this before, which inspired me to start my collection. Susan Kare of Apple took similar goals and came up with a very different design called Chicago. My 8x8 rendition of Chicago is shown in the collection, under the title "Who's Cuter". So did whoever at Commodore came up with the font included in the C64 KERNAL. Correct me if I'm wrong, but didn't Nintendo have a really primitive hardware rig set up for their early games? I seem to recall seeing old photos of this setup floating around, a while back. Keeping things simple would have been advantageous, in this case. Yeah, they did. Such pictures I believe are in issues of Nintendo Power. I'll dig through mine (yes I have 'em!) and see if I can find them + scan/provide pictures. It's a system that visually looked very similar to Sega's "Digitizer" System. No, even earlier than using computers, Masayuki Uemura, the Famicom's designer (I think it was him, at least) said in a presentation that the first hand-drawn graphics were input into the dev system by means of an 8x8 grid of lights and photoreceptors (built by Uemura). Basically, binary graphics were scanned in one character at a time. That could go a long way in explaining the primitive graphics of a lot of early Fami games. Oh, and other companies at that time brazenly disassembled Nintendo's Famicom games to figure out how the hardware worked. I would not be surprised if they also copied the CHR graphics wholesale until it became necessary to change them before their own products' release. Yes! This is precisely what I was talking about! There's an old photo floating around, of this set-up. It was possibly posted somewhere on Twitter? I have no idea where to look for it, though. Lots of bright, chrome-shaded characters with cartoony proportions and no outlines. The Atari ST had fewer restrictions than the NES, but it saw the same amount of stylistic consistency between different artists. Simply put, without modern references like VG-Resource, all these artists could do is look to their contemporaries to learn how to translate designs into pixel art.